This stunning luxury camping site is next to Veerse meer, a beautiful lagoon close to the North Sea. Camping de Schotsman offers thrilling experiences on the water and fun for campers of all ages. A camping holiday here will leave you refreshed and filled with fantastic memories. 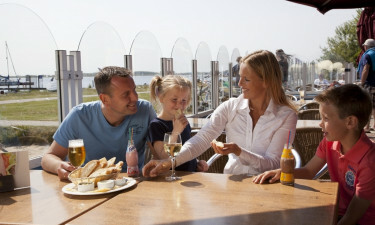 Situated on the banks of Veerse meer in Kamperland, this campground delivers a luxury experience with lots of amenities. A recreation programme keeps you entertained and active throughout your stay. You can also see more of Zeeland with visits to nearby Middelburg and Veere. Book your stay today with LuxCamp! Why Choose Camping de Schotsman? Sports and outdoor enthusiasts will love this camping holiday destination. Diverse sports facilities let you practice volleyball, mini golf, tennis, and more. Younger campers can burn energy at a delightful playground. There is a supermarket stocked with everything you need, and you can eat or drink at the campground’s restaurant or snack bar. 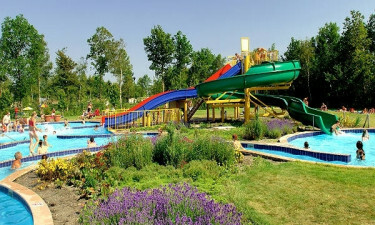 This full-service holiday camping destination is home to a unique outdoor pool area steps from your mobile home. Surrounded by woodland, the beautiful heated pool offers a relaxed space to swim and play. The pool also has exciting waterslides. You can also swim in the lagoon or soak in the sun from its banks. 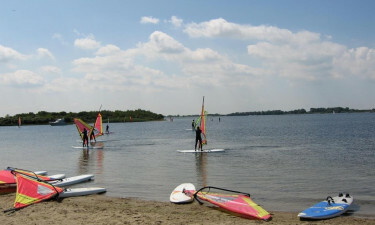 The lagoon is also a popular spot for windsurfing and sailing. To help you learn these sports safely, the campground also has its own windsurfing and sailing schools.